Ben is in a wheelchair. He is funny, intelligent, and desperate. Together with his caretaker Christian he gets to know the cellist Annika, who is overwhelmed by her studies at the conservatory. They become friends – until they fall for each other. What starts out as a game for Christian becomes a journey for Ben to face his greatest fears, to spiritual abysses that he won’t be able to find his own way out of. Intern. Filmfestspiele Berlin – opening film in the section Perspektive Deutsches Kino Filmkunstfest Mecklenburg-Vorpommern, Germany – Young Talent Award of the Defa-Stiftung, Cinestar Award Filmfest Emden-Norderney, Germany – NDR Film Award for Young Filmmakers, Festival des deutschen Films in Ludwigshafen, Germany –Audience Award, Filmkunstpreis 2010 „Special Individual Performance“ for Robert Gwisdek Seattle International Film Festival, USA – Shanghai International Film Festival, China – Montréal World Film Festival, Canada – Festival of German Film in Madrid, Spain – Lubuskie Lato Filmowe, Poland – European Film Festival Palic, Serbia – The Norwegian International Film Festival Haugesund, Norway – Festival of German Film in Buenos Aires, Argentina – German Film Festival in Paris, France – New German Cinema, Tallinn, Estonia – Festival de Cinema Europa, Mexico – Berlin & Beyond San Francisco, USA – German Film Weeks Krakow, Poland – Germany laughs – Festival, Bucarest, Rumania – Ciné-Festival en Pays de Fayence, France – Univerciné Allemand, France – German-French Festival Kampala, Uganda – German Film Festival Singapore – European Film Festival, Canada – European Film Days Tunis, Tunisia – Festival of German Film Moscow, Russia – Intern. 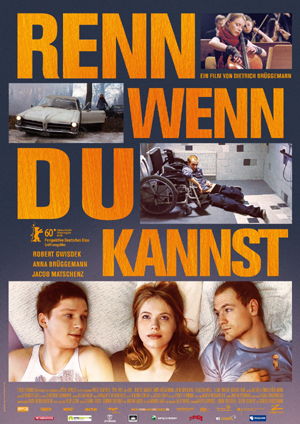 Film Festival Havanna, Cuba – German Film Weeks Tashkent, Uzbekistan – Göteborg International Film Festival, Sweden – Youth Film Festival Deventer, The Netherlands.